Noted developer CoolStar breathed a new life into the iOS jailbreak community by releasing the Electra iOS 11 jailbreak last month. CoolStar has now made a new version of Electra available to download for jailbroken iPhones and iPads. You can download the Electra 1.0.4 IPA file right here. The new version comes just days after the developer made the version 1.0.3 available to people desperate to liberate their iDevices. The Electra 1.0.4 version brings minor changes to enhance stability on jailbroken devices. CoolStar has removed the XPC code that was reportedly causing problems since its first implementation in Electra beta 11. The developer also took the help of people behind Meridian to replace the UDP, TCP, and XPC with MIG to improve the stability of their iOS 11 jailbreak. 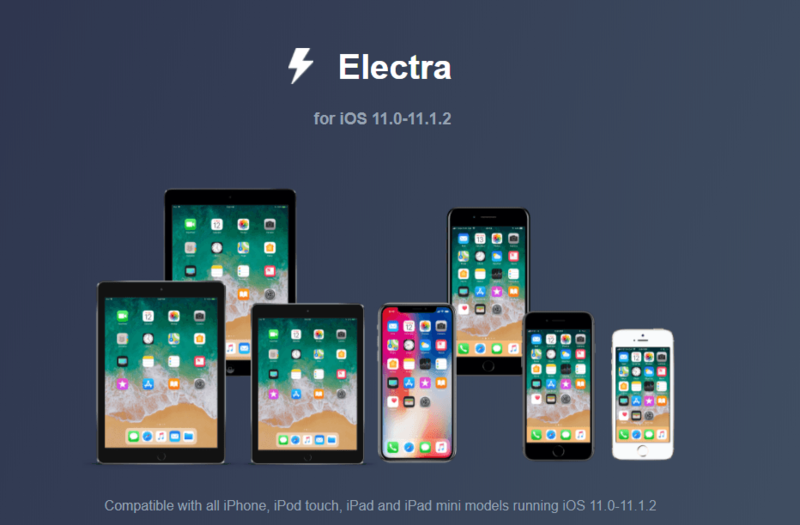 Electra 1.0.4 supports 64-bit devices running iOS 11.0 through iOS 11.1.2. People still using 32-bit devices are out of luck. The jailbreak would work on Apple’s latest offerings including the iPhone X, iPhone 8, and iPhone 8 Plus. If you have used an older version of Electra’s iOS 11 jailbreak tool, you can upgrade to Electra 1.0.4 version by deleting the Electra app from the home screen and re-sideloading and re-jailbreaking your iPhone or iPad with the latest Electra 1.0.4. Electra is a semi-untethered jailbreak solution. It means you’ll have to open the Electra app and re-jailbreak your device every time you reboot it. You will also have to repeat the jailbreak process each time the jailbreak certificate expires. Cydia comes bundled with Electra as Coolstar has added support for Cydia. Also bundled is the Substitute framework that allows you to install the tweaks. Download the Electra 1.0.4 IPA file on your computer from here. All done? Now you are fully prepared to jailbreak your iOS 11 device. Step-1: Connect your iPhone or iPad to the computer via Lightning cable. Step-2: Take a complete backup of your device using iTunes. It will ensure that your data is safe if something goes wrong while installing the jailbreak. Step-3: Launch the Cydia Impactor that you downloaded on your computer. It will detect your iOS device. Step-5: A prompt will ask you to enter your Apple ID and password. Enter the credentials to confirm. Now Cydia Impactor will sideload the Electra 1.0.4 IPA onto your iOS device. Step-6: After the Electra IPA is installed on your device, go to Settings > General > Profiles & Device Management. Just tap on the Electra app profile, then select Trust and Trust again to confirm it. Step-7: Go back to home screen and launch the Electra app. Step-8: You’ll see a Jailbreak button in the center of the screen. Make sure that the Tweaks toggle is on before tapping on the Jailbreak button. The jailbreak process starts now. Step-9: Electra will do all the work. You’ll get a prompt that says “APFS Screenshot Created.” Just tap on “Continue Jailbreak” button. The AFPS Screenshot allows you to go back to iOS 11.1.2 using SemiRestore if the jailbreak goes wrong. Step-10: After some time, you’ll see the message that jailbreak is successful. You shall find Cydia Installer on the home screen. Launch Cydia then tap Upgrade Essentials and wait for the process to complete. Step-11: Now install your favorite Cydia tweaks on your jailbroken device. Enjoy the iOS 11 jailbreak. But remember that it’s semi-untethered jailbreak, meaning you’ll have to re-jailbreak the device each time you reboot.